Under the glow of festive holiday décor, guests gathered in Emory University School of Medicine's Margaretta Taylor Lobby to celebrate Monica Farley, MD, professor of medicine and director of the Division of Infectious Diseases at Emory School of Medicine and staff physician at Atlanta Veterans Affairs Medical Center, as the first Jonas A. Shulman Professors in Infectious Diseases. The event also honored the legacy of Professor Emeritus Jonas A. "Jack" Shulman, MD, retired professor of medicine at Emory School of Medicine, retired executive associate dean of medical education and student affairs at Emory University, and former chief of the Division of Infectious Diseases in the Department of Medicine, whose many contributions to Emory School of Medicine and Emory University Hospital Midtown have set high standards. Vikas Sukhatme, MD, ScD, dean of Emory School of Medicine and chief academic officer of Emory Healthcare, greeted a room of Emory School of Medicine faculty and alumni, members of Woodruff Health Sciences leadership, as well as friends and family of Drs. Shulman and Farley. "By naming someone to a professorship, we are telling the world we believe he or she—his or her work—is at the highest level," Dr. Sukhatme explained. "Tonight we get to celebrate the accomplishments of our colleague, Monica, and honor her being named the first holder of the Jonas A. Shulman Professorship in Infectious Diseases." 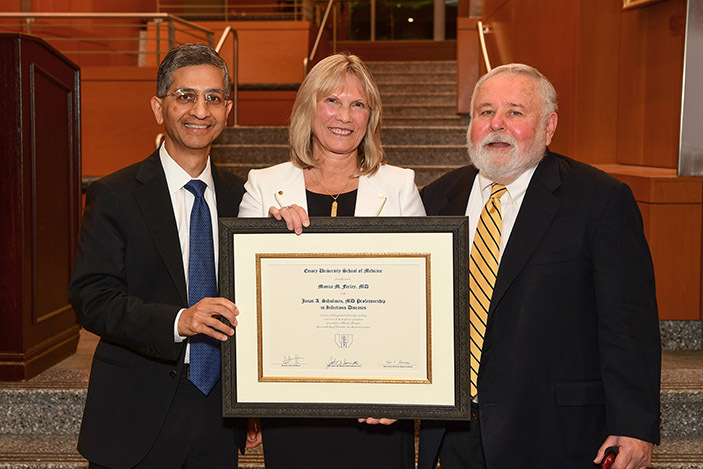 Stressing the importance of endowed professorships, Dr. Sukhatme went on to say, "Endowed professorships create legacies of excellence and strengthen the School of Medicine in significant ways. They allow the School of Medicine to recruit and retain outstand­ing clinical and research faculty, such as Monica." Among the evening's speakers was David Stephens, MD, vice president for research at the Woodruff Health Sciences Center and chair of the Department of Medicine at Emory School of Medicine, who presented a history of the Division of Infectious Diseases and the roles that Dr. Shulman and Dr. Farley have played in its growth and success. Carlos del Rio, MD, the Hubert Professor and chair of the Department of Global Health at Rollins School of Public Health and professor of medicine in the Division of Infectious Diseases, recounted kind memories about working with Dr. Shulman before inviting him to speak. Wendy Armstrong, MD, FIDSA, FACP, professor of medicine in the Division of Infectious Diseases at Emory School of Medicine and vice chair of education and integration in the Department of Medicine, then introduced Dr. Farley's many accomplishments and contributions to the Division of Infectious Diseases before Dr. Sukhatme presented the certificate of professorship. Dr. Farley thanked her family and friends for joining in this joyous event and spoke about the honor of being named to a professorship, as well as how this endowment will help support her research. The evening concluded with refreshments and Dr. Sukhatme's closing remarks. 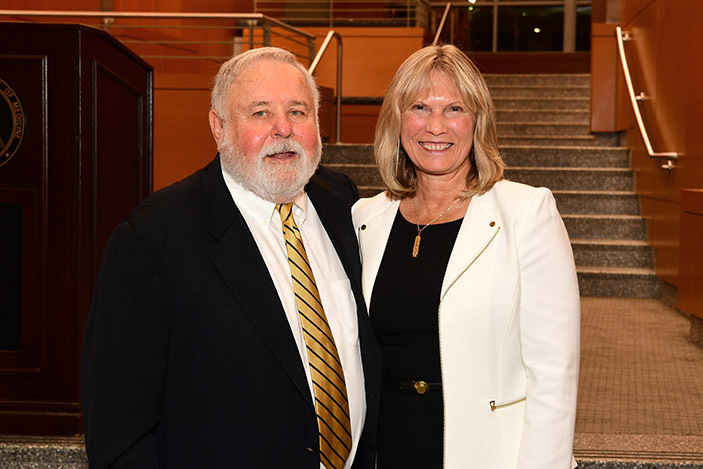 "It is such a joy to celebrate the excellent leadership we have at the School of Medicine," he said.